.......and spring was in the air for Booker's glider pilots, with over 50 launches and at one point three tugs working to meet the demand. 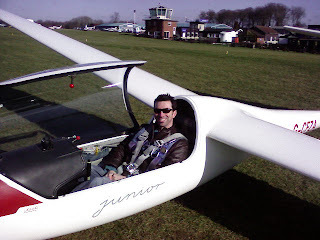 Mark Wolfe (pictured) converted to the Junior and John Portwin completed his Bronze flight test. As well as the usual mix of trial lessons and instructing, various aerobatics sorties were flown, including one by Rob Kehr who has really taken to this branch of flying. And a number of private owners took the opportunity of blue skies and sunshine to rig and get some air under their wings. Next Saturday we will have another in our series of 'winter' lectures, this one by Denis Campbell on Cross Country Error Management, not to be missed. Whilst others were thinking of St. Valentines Day....restaurants to book, flowers to buy, cards to write, the stalwart glider pilots of Booker went along instead to Jim White's presentation on Cross-Country Met. Here we learnt about jetstreams, coriolis effect, weather systems, the Rossby Wave and what it all means in terms of predicting soaring conditions. A fascinating insight into a topic that the more you learn about, the more you realize just how little you know about the subject. Meanwhile Gerry Leach decided to adopt the ostrich approach to flying but couldn't find any sand to stick his head in so used the Pawnee instead under the expert guidance of Jon Gatfield who looks like he was timing how long Gerry could maintain this position. The overnight frost has solidified the lying snow, still 3in deep, and it looks as though we wouldn't get off the ground before the hedge, so Graham's aerobatics course will today consist of briefings on the flight envelope and the figures to be flown - after the thaw.